James Couch worked in Kentucky coal mines for nearly four decades before he was diagnosed with black lung, a disease that, after a period of sharp decline, has made a comeback since the 1990s. Couch sued the manufacturers of respirators he wore while working in underground mines, alleging their failure caused his injuries, and won. Now the manufacturers are facing the possibility Couch’s suit may be the proverbial canary in a coal mine—a warning sign of suits to come. Black lung disease, or coal worker’s pneumoconiosis, is an incurable disease characterized by a persistent cough and shortness of breath that worsen over time. The Centers for Disease Control and Prevention reported in 2016 that, though the incidence of black lung disease initially fell sharply after dust limits for coal mines were set by the 1969 Coal Act, the disease has come roaring back. For example, the CDC report cites a cluster of 60 incidents of “progressive massive fibrosis” in Eastern Kentucky identified between January 2015 and August 2016. 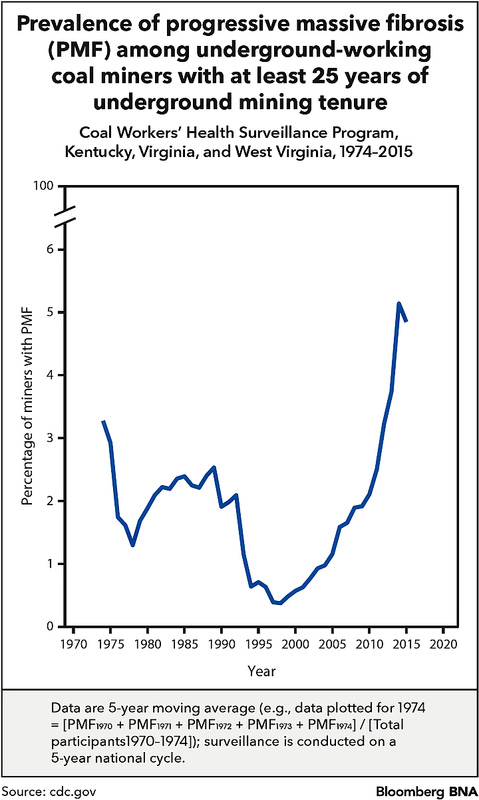 PMF is advanced stage black lung disease. The federal agency points the finger at lax dust control in underground mines and says another suspected reason for the uptick is the use of “slope mining.” That extraction method involves digging through hundreds of feet of sandstone to reach a sub-surface coal seam, which could expose miners to high levels of silica. A few months before the new CDC report came out, a Kentucky jury awarded Couch $7.2 million against mask maker Mine Safety Appliances Co. in what is believed to be the first coal dust jury verdict against a respirator manufacturer in the country (Couch v. Mine Safety Appliances Co., Ky. Cir. Ct., Knott Cty., No. 10-CI-155). American Optical Corp., one of the biggest respirator producers, settled Couch’s claims against it for an undisclosed amount of money. A number of other defendants also settled the claims against them. Attorneys and others interviewed by Bloomberg BNA wouldn’t predict whether Couch is a harbinger of more jury verdicts and settlements for miners against mask makers. But if the verdict stands, some say it may drive more filings, adding to the dozens of suits already pending against mask makers in coal country. It also may alter the parties’ assessments of the strength of their cases, which could affect settlements and their willingness to push these cases to trial. “In light of the fact that this was the first coal case in which any respirator manufacturer had taken to verdict, it’s just too early to determine the effect of this one case,” Mark Deasy, a spokesman for Mine Safety Appliances, told Bloomberg BNA. But the verdict certainly has been noticed by miners and plaintiffs’ attorneys working in coal producing states like Kentucky and West Virginia. With coal production supported by President Trump and showing a new uptick because of favorable market conditions, expect that attention to grow. The Couch verdict “got the attention of attorneys that practice in the area, and highlights that there may be another remedy that they hadn’t thought of a year and a half ago,” plaintiffs’ attorney Timothy Bailey with Bailey Javins & Carter LC in Charleston, W. Va., told Bloomberg BNA. Bailey’s practice includes representing miners in personal injury actions. He has represented workers injured and killed in well-known mine collapses such as those involving the Upper Big Branch, Sago and Aracoma mines. Whether more of these suits go to trial will come down to the parties’ assessments of the strength of their cases, Bailey said. “If defense counsel believe settling early sends a signal this will be a bonanza of easy money, then they’ll fight,” he said. “But as in other mass tort cases, attorneys look to see how the first x number of trials go and if they start losing, they might change their posture,” Bailey said. And with the number of cases of black lung on the rise—an increase some attribute to the newer mining practices that expose miners to high amounts of silica as well as coal dust—more of these suits are already being filed. In its annual report to investors, Mine Safety Appliances, the manufacturer found liable in the Couch case, said it experienced an increase in coal dust-related claims filed in 2016, though it didn’t specify how big the increase was. The recent rise in black lung dates back to the coal boom from the mid-1990s until 2010, which was driven by the demand for metallurgical coal used in steel production, Bailey, the plaintiffs’ lawyer, said. “The big fat pure seams of coal had been mined out,” he said. As the price of coal went up, it became worthwhile to mine the coal that was harder to reach, coal with a lot of silica rock in it, Bailey said. In addition, as the coal industry moved to non-union work sites, miners became afraid to have their lungs checked for fear of getting laid off, he said. And since black lung is a latent disease, miners are now manifesting diseases caused by those exposures that occurred during the boom, Bailey said. Stephen Sanders, director of the Appalachian Citizens’ Law Center in Whitesburg, Ky., agrees that the combination of coal dust and silica exposure is likely what’s driving the increase we’re now seeing. “Doctors generally say 10 years of coal mining work and dust exposure is sufficient to cause lung disease,” Sanders said. And PMF may be the type of illness that is ripe for litigation against respirator manufacturers, Sanders said. And there may be additional cases coming another 10 or so years down the pike. That’s because, after years of declining coal production as cheap natural gas displaced it, coal mining has shown an increase this year. 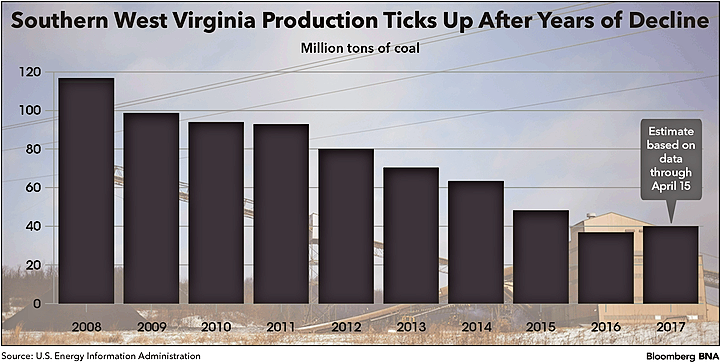 Through mid-April, for example, as the price of metallurgical coal tripled, coal output has risen 9 percent in southern West Virginia compared with a year ago, according to Bloomberg News. So more workers are headed back into the mines, extracting coal from seams mixed with silica. A One-off or More to Come? It’s impossible to know whether the Couch verdict is the shape of things to come, Professor Patrick McGinley at West Virginia University Law School in Morgantown, W. Va., told Bloomberg BNA. “Is Couch a one-off? It’s not clear,” he said. 3M and other makers have had success in defending non-coal dust respirator suits, McGinley said. That suggests that coal dust plaintiffs have to meet a high burden to prove their cases, too. In fact, just six months after the Couch award was handed down, another jury in another black lung suit against a respirator maker went the other way. That verdict, also in Kentucky, marked the first coal dust respirator case to go to trial against 3M Co., which was also a defendant in the Couch suit. And the success of mask makers in defending similar cases, such as those involving asbestos and silica, was recently demonstrated in Mississippi. There, the state top court May 18 upended a $14 million jury award in a silicosis case brought by a former construction worker. The court reasoned the worker knew more than three years before filing suit that he had an injury, even if it wasn’t diagnosed as silicosis. “Similar issues face plaintiffs in establishing manufacturer’s liability for a defective respirator product—whether the exposure is to coal dust or other fine particulate matter,” he said. But coal miners, who have done tough work for generations despite the health risks, have the advantage of arguing their cases to juries in coal country. But Professor Timothy MacDonnell at the Washington & Lee University School of Law in Lexington, Va., told Bloomberg BNA that, in addition to drawing more attention to the issue, recent studies like the 2016 CDC report could help coal miners prove causation. That being said, MacDonnell said the universe of potential suits is limited by the fact that miners often do their work without wearing protective masks, which can be hard to both breath through and see out of. For now, however, coal miners’ respirator suits show no sign of abating. Earlier this year, former miners Lonnie Prillaman and Barry Shrewsbury filed coal dust claims against Mine Safety Appliances in a West Virginia trial court ( Prillaman v. MSA, 17-C-10 (W. Va. Cir. Ct. 1/26/17); Shrewsbury v. MSA, 17-C-11 (W. Va. Cir. Ct. 1/26/17)). And in Knott County, Ky.–the county where the Couch award was handed down–dozens of suits are pending against mask makers, including half a dozen filed in 2017. It is appealing the Couch verdict after its legal counsel “concluded that, based on their assessment of the appellate issues, a reversal of the adverse judgment is reasonably possible,” the respirator maker said in its annual report. Counsel for Couch, Mine Safety Appliances, and 3M declined to comment for this story.